Up bright and early today - lots of work to do for later on we are off to Melbourne to see Nigel Kennedy play tomorrow night. This is our treat - only 2 small suitcases and no threads! We will be back on Sunday. 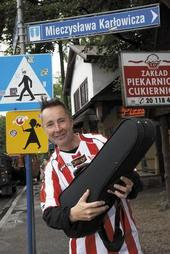 Nigel Kennedy is such a fantastic artist that we always consider it a privilege to watch him play. He is not coming to Perth so we shall enjoy him playing Mozart and Beethoven with the Melbourne Symphony Orchestra. for anyone who might enjoy hearing what a brilliant player he is. Here is the next page for my Marrakech book. I am working on the back cover which I shall take with me - I machined up an awful lot of cord yesterday - my Bernina needs oil so I dare not use it until I get some. it is nearly done. ps 41.5 degrees yesterday - looking forward to cooler weather in Melbourne - Ian is not happy with the state of his new lawn. The rest of the country is having pretty wet and cool weather so we have everyone's heat - our bedroom has been heavily sprayed today after I got eaten by a tribe of mozzies last night. The amount of itching I did I thought I would be covered in welts when I got up this morning. You may remember I bought a dummie so I could photograph my Virgin Bride dress. 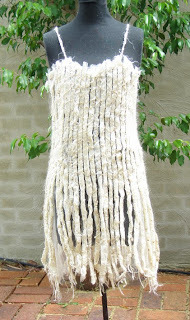 I like this dress - it was quite an innovative slant on silk paper making and machine embroidery and stuff for me at the time and I sent off photos to Lark Books as a submission for their 500 Art to Wear book. I got a letter from them today and unfortunately they didn't enough submissions to be able to produce a book. What a shame indeed. Here is my book cover -I am a little anxious that I won't get it finished but it is starting to fall into place -I did some more tonight while I watched Dalziel and Pascoe (the empty space high up is now filled with thread) - and I have started on the back cover and also set the machine up to stitch the back of page 3. 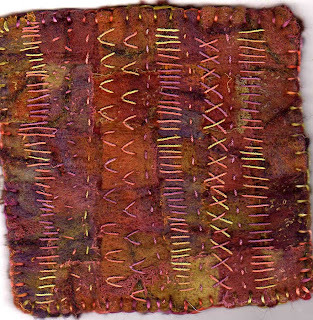 Tomorrow I will do all the machine stitching so I can hand stitch at night. Last night we went to a Musica Viva concert which was pretty ho hum. Maybe we have been spoilt in the past with fabulous performances (like Maurice Till and The Prague Quartet in Christchurch when we were students) but the Schumann Piano Quintet lacked that special excitement. 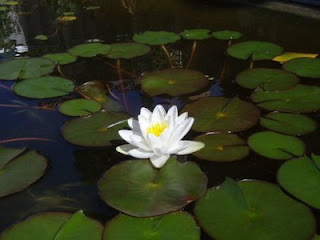 I have stolen this pic of Bruce and Kazuko's water lily since mine has not got any flowers. I have just rescued mine and brought it out into the garden where it is much happier - I expect to see it competing in the fabulous flower stakes before too long! 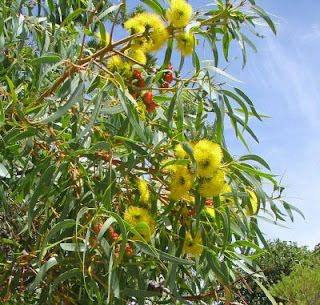 Thanks Debbi for giving me a Make My Day award - I still have my favourite make my day blogs from a few entries back and I very much enjoy checking them out every morning. Here we are back home again. Melbourne was great - we always like going there. 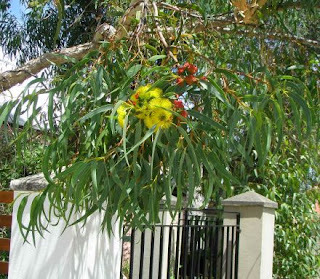 The weather was cool and even some rain - we stay near Flinders Station and enjoy the walk in the morning and evening. I took my camera but of course forgot to use it. I should have had my wits about me to take a photo on day 1 of the show then you could see how congested it was and how busy we were. Lovely to catch up with so many people - we never have enough space and people were very good about having to climb over things and wait patiently. Luckily we had someone to help each day - thanks Jacinta and Rae! My talk seemed to go well apart from the fact the 30 mins was only 20 due to the rudeness of the person following. I hate it when people feel they are so important that they have to make a scene - in those sorts of situations we should be working together - everyone is under pressure - the conditions are lousy and we can all only do our best. Thank goodness our customers are all nice people. 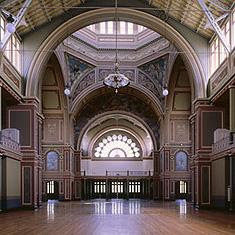 Anyway the venue has become too small and next year the event is moving to the Royal Exhibition Building in Carlton. Melbourne has a lot of wonderful old buildings - Perth seems to have managed to knock most of its down in its wisdom. We enjoyed our evenings - out with Rae and Frank, out with the cousins, out up the laneway. We watched the rugby - of course - and the Hurricanes did win but still a bit wobbly. However my loyalties remain. I try to take what I think will be right for the shows we do but of course you always run out. That palette and a half shrank down to half a palette for return and our cases (all 6) were half the weight. So back home flat out counting and re-ordering and filling all the orders which came while we were away. This is why going to shows is something we are doing less and less of. I did mange to work on my Marrakech book while we were away and I should have the cover ready tomorrow so I will post it then. 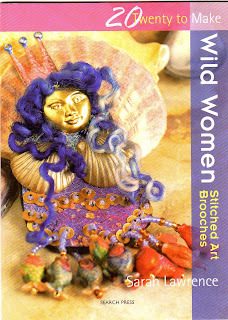 Came home to lots of orders, lots of parcels including a shipment of more flower stitch feet (just as well), a shipment of Cloth Paper Scissors No 17 (they will be going out tomorrow) , a box of Wild Women books from Sarah Lawrence - really gorgeous - I will have to get cracking on my Wild Women. I also got some new little charms to use on them as well. Hoping to get to the studio tomorrow. After such a disgraceful meal being offered to us on the flight home, I think Gogos is in order tonight and anyway it is very hot out there. Qantas ran out of whatever their first choice was and presented us with something they called potato gnocchi with broad beans. It looked disgusting and one tiny mouthful confirmed it. I don't know why they ever pretend to bother offering meals. Grant was sailing in the 18ft champs on Sydney harbour and sadly we weren't there - I have finally got a photograph - they came 4th in race 5 or 6 - and were first off the start. Good on them. Off to count some more stuff. 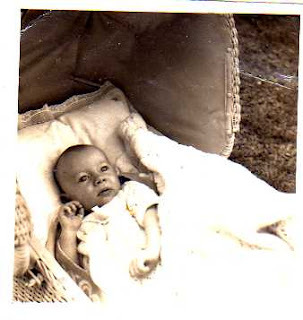 Oh and Ian says thanks for all the birthday greetings and it's nice to know he doesn't look any older than when he was 7 weeks. Lisa has tagged me thanks Lisa and I will see you tomorrow. I will try to list 7 things but I won't tag anyone else. There are lots of good blogs and I really enjoyed my Make My Day list which still does! The first weekend of the Super 14 Rugby has been and gone - my heroes ran around like headless chooks and lost by a phenomenal amount. If I recall they lost their first game last season too. This is Jason Eaton who has not shaved since he damaged his knee just before the World Cup but come Wed he is having it all shaved off for CanTeen - definitely looked different! 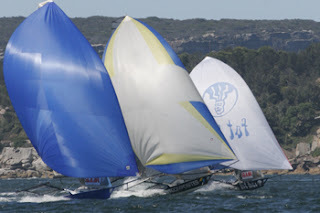 If you are in Sydney, the wonderful 18ft Skiffs are sailing in their championships. Grant is out in his new boat - SLAM - but I have no idea what it looks like. However they make a great sight on the harbour and something we always enjoy watching but not this year. Ian is cleaning the gutters and I am supposed to be packing suitcase no 1 before we go out. We fly to Melbourne on Tuesday but it sort of helps if I can get a couple of suitcases done about now. I am working away on the Marrakech book but it is in planning stages really although I am hoping to take it with me to work on. This is one side of page 3 - I am working on Romeo for the other side. Here is the cover underway - at the moment I have some flower stitcher rings but I may change this - the cover is based on a drawing of a window cover which was outside our room at the Riad. 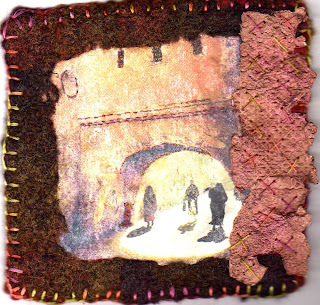 This is the back - a patchwork of sorts. Thanks for all the lovely offers of snow, cold, rain - they must have had an effect as the weather is much nicer today and should be good tomorrow as well. It is even trying to rain. You might think we have done nothing the last couple of days but not so. The weather has remained ghastly and tiring and to continue. Send me your snow - your lovely cool breezes - your rain and I will parcel up hot and humid and post it as fast as I can. 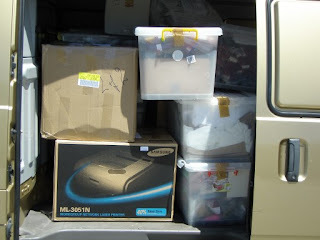 This morning we finished packing everything, filled the van and drove it to the carriers - I went too to help Ian unload from the van - it makes it easier if there are 2 of us. This is the stuff in the van which we loaded onto palettes and this time the guy shrink wrapped it for us - Ian usually does it. When we get to the show it takes me ages to get the shrink wrap off and I get quite dizzy. When we did the show in Sydney last year we sent 4 palettes of stuff so this lot looks a little puny by comparison. I was fascinated to watch them lift the huge containers and swing them over the top of my car...... with me inside listening to music trying to keep cool while I waited for Ian to finish the paperwork. Anyway the house is clean and tidy and tomorrow I will be able to get back to my Marrakech book which has been inactive while I got all of this business stuff done. While I was looking through my photos for the one I want to print and stitch, I came across this lovely city scape which we took from our rooftop. Don't you love the colours. I am also putting together my Wild Women and Friends little extra catalogue for Melbourne - we have had some glorious charms highly suitable just arrive including fabulous double sided faces which you can thread from top to bottom of from side to side. Having sat on 99 countries for ages my counter has suddenly rushed to 101 and I can't work out which the new 2 are as the countries seem to change around on the chart. Finally Carla asked where she could buy my book in US - you can buy it direct from us Carla - we have been sending them all around the world and they seem to arrive in record time. The weekend was spent packaging and sorting and stuff. One of the good things about getting ready for a show is that I find stuff I had not realised was there. I keep a huge container between the kitchen and the sunroom and right now it is very tidy and almost empty. I put things there when they arrive often with the plan of getting to them before too long. Before too long can take a while. So yesterday afternoon the container was practically empty, the kitchen remarkably tidy and we went for a swim at the Nedlands yacht club - we like to go swim in the river rather than the sea which I reckon is overrated. The river is quite salty at present. Then we went off to Luigi and Martien's for dinner and we stayed and chatted about all the wonders of the world and more. Got home very late - it is still very hot. 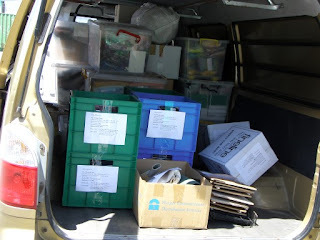 This morning the tidy situation changed somewhat as I started filling up boxes and remembering more things that needed packaging. 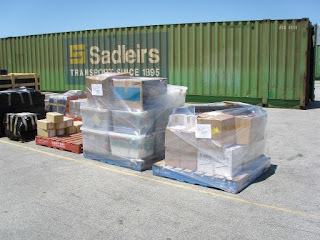 I spent a couple of hours at the lockup where it was extremely hot (no air con there) and came back to parcels, orders etc. in the midst of everything else, a couple of new books arrived. Both very interesting and full of many good ideas. Shall find time to have a read later tonight. For some interesting trivia - in 1996 it was 42.6 today but I doubt if it was as humid. Maggie was saying she came up with the idea of WOW whilst in the bath. Maggie - the only thing in our bath are the outdoor cushions through the winter for when /if it rains. The Thread Studio came about when Ian and I were camping down on Coalmine Beach near Walpole - the Valley of Giants Tree Walk. We took our laser down to sail on Nornalup Inlet and used the mast to hold up our lean to to the tent - lost it every morning of course when it was needed for more important matters. one night over our bbq I suggested that I thought a mail order thread business would be a good idea for if I couldn't get stuff I wanted them I suspected others might feel the same. Seems it was the best idea I have had. I also told Ian I thought I would get a new ribbon for the typewriter but he moved onto bigger things like a computer and you know the rest of the story. That was in 1995. 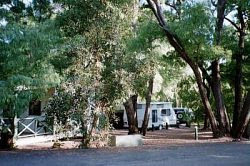 We haven't camped at Coalmine Beach since although we have been down that way. 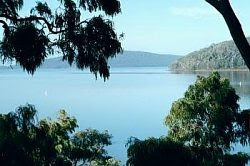 it's a beautiful inlet and the camp ground is one of the best anywhere. Somehow I seem to have lost a day - it may be the excitement of the rain, or maybe the boring packaging and packing - who knows? Anyway first up - the rain was absolutely glorious - I did not make mud pies but I was outside at 5.30am , naked, rescuing the cushion covers. Now that has probably put you off your cup of coffee but an emergency is an emergency. We had a wonderful day as it rained all day although miraculously it stopped for Ian's bbq. For those of you who have been worrying that we have not been able to watch any rugby for a while, fear not. The season for the Super 14s starts next weekend but in the meantime the pre-season games have been on and on Thursday we had the gang and extras for a bbq before the Force played (and beat) the Qld Reds. It was on at our park - Perth Oval (yes the very same place where the 2 Police Concerts were held). The season games are at Subi Oval - hardly suitable for rugby so we will all be off to Chez Bruce and Kazukos. 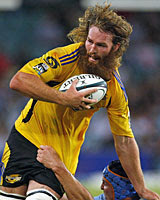 I should add with pleasure that the Hurricanes beat the Brumbies in their preseason game. Next weekend the Hurricanes play the Waratahs in Sydney. As usual Ian is still to choose his team - he likes to wait until the final I think. Bruce and I know where our loyalties lie. 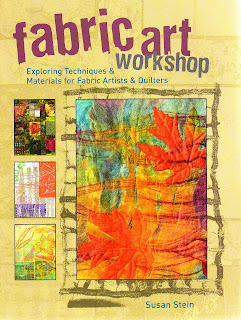 I am packaging and packing for the Quilt Convention in Melbourne. So boring and tiring but it must be done. The onahead stuff goes on Wed - I seem to have been cutting and packaging all week and have spent this morning winding big bundles and rolling scrim bundles. Nearly there with that part and then I have to get it into all the boxes. 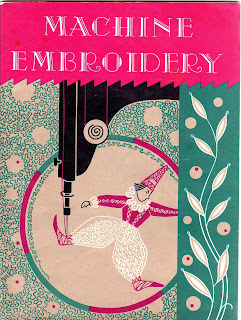 I have been cruising through another old book - this time by Dorothy Benson - published by the Singer Sewing Machine Co - it doesn't have a date but I think it is around 1935. An incredibly good book - full of lessons which are very clear and easy to follow and loaded with drawings (in colour too). I found the chapter on granite stitch very good. I don't know what I paid for it but well worth it. Many of my good customer Christmas goodie bags had a lolly (sweetie) wrapper inside and people have been asking me what they might do with them and where were the contents. Well Luigi ate most of the insides and in their restaurant they asked the customers for the wrappers for their friend (me) so you missed out on that score. I have a lot, of course, and I used them to make my Luigi lolly dress and for my Christmas cards and also in metal work - bond them (Linda pointed out the need to do this..) onto a backing and stitch them and cut them up. 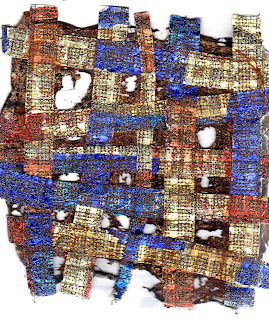 This piece is woven and stitched to panne velvet, burnt out, chiffon on top etc etc Don't throw them away. 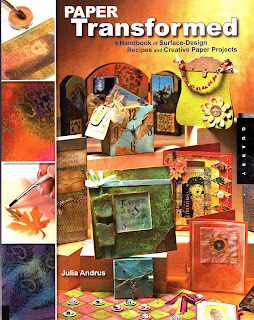 Use them under chiffon, trapped, cut into squares and reapply - just let your imagination roll - once the interiors are eaten they are a free resource! 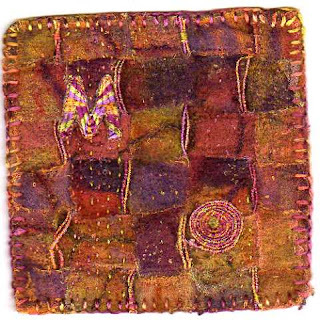 I have as good as finished all my Shiva samples - just waiting for the last ones to set so I can send my article to Machine Embroidery (and textile art) for the June issue. 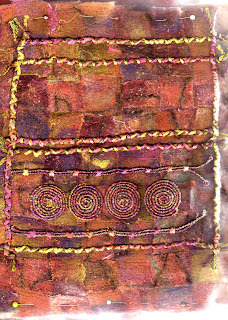 Then back to the book - page 3 nearly done - lots of stitching machine for this page - and the cover just getting underway. HH stuff slowly but slowly. Off to cook a curry for tomorrow and get ready for our bbq tonight. 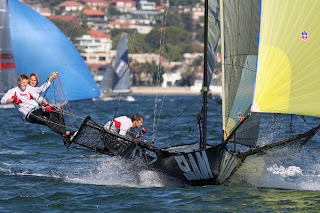 Grant has gone to Sydney for the 18ft Skiff Champs on the harbour - shame we can't go this year. Happy New Zealand Day to all Kiwis. Muggy weather has not yet gone away and promised thunder has not yet arrived. for a wonderful read especially if you like cats. Tonight we are off to the ACO for a wonderful (for sure) concert. As a matter of trivia I have now had 100,050 visitors from 99 countries since November 2006. We keep being told it might rain or thunder - I think it means the weather will remain as humid as imaginable. Kinda slows you down. 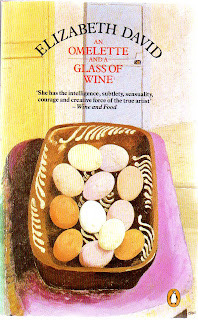 Very late last night I watched a documentary on Elizabeth David (on the ABC a few weeks back) - I have had her writings and cookbooks from way back when so I really enjoyed this small insight into her life. Naturally, I have pulled out all of her books I own - the cook books are all dirty and well used which means I must have cooked plenty from them in the past. I have lots of cookbooks but I often just read them - I think the reading about recipes and surrounding info is as good as cooking and eating sometimes. This afternoon - early evening - we have been sitting outside in the heat with our glass of red and I have been enjoying rereading her articles from the above book - flicking through. Many things have not changed I must say. 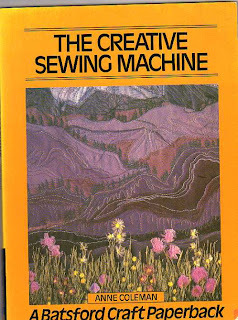 Pleased to see many of you are dragging out your old embroidery books - they are all a gold mine. 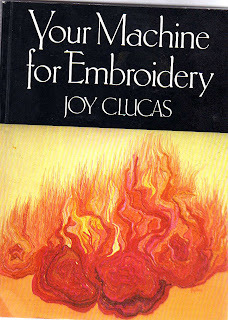 I have pulled out 2 more - this one below and The New Machine Embroidery - both by Joy Clucas - can anyone tell me what has happened to her? Is she still alive? Some of her ideas are superb - I am making notes all over the place. Leanne asked about the Elizabethan wardrobe book. It's a very expensive book, Leanne, and I would hesitate to tell anyone to actually buy it. It cost me $175 but for me it is a fantastic resource. Loads of info and pics of garments and close ups. It's probably in the libraries so worth looking first. Yesterday afternoon I took myself off to my local Embroiderers' Guild group - must say I enjoyed myself and the 2 hours of stitching I got done. Shall go again. While flicking through my Marrakech notebook I came across a hastily drawn sketch of an old window shutter which was hanging outside our room at the Riad. I had taken a photo but it was too dark to be any good but this gave me the exact idea I needed for my book cover. Keep watching this space. 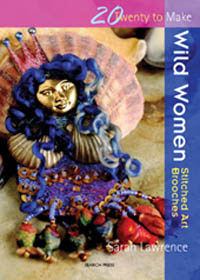 Last little gem - Sarah Lawrence has a book coming out - Wild Women - it won't be here until the end of the month but I want to pre-empt our Wild Women Swap we are going to have for August at our Craft Quilt and Stitch show in Perth. There will be a notice on our website before too long but I am looking at a swap like we did with the ATCs - this is a fantastic opportunity to break out! More info coming. Now, with all the talk of food and recipes, we are sneaking off to Cafe Asia just down the road for a casual and very good meal. The fish is superb. it's not that we don't like Police - in fact we have some of their cds in our collection of 6000 tunes and I really love Songs from the Labyrinth - but that many decibels is too much. At least the sound was clear - just hard to escape. When Pink Floyd came to the Perth Oval, it was very windy and the sound was distorted so we went out one night and the second night went over to the park to listen - seemed to be lots of people wandering around a little worse for wear from goodness knows what. However, none of it was as bad as the 2 nights they had the truckin' stuff....... Rod Stewart in a couple of weeks - surely he can't sing that loud? To add insult to ear attack, I managed to completely wreck my Marrakech page 2 which I have had to redo this morning. Never spray walnut ink over printed surfaces if you have a hankering to touch up the edges. Do it before you do all of your stitching. It was the first time I have used Extravorganza (well I had to do it twice) and it was so effective and easy to use and I love the overlay effect. You will see more of this from me for sure. You should just be able to see the words as well. This photo is a bit dark but it is certainly much better than the scan was. Thanks Susan - what a wonderful idea. Tonight at Chez Rollerson is The Police concert - well at is at Perth Oval but it might as well be in our garden. We shall sit outside with a wine and then pop out to GoGos. Tomorrow night is the second concert and we are having a family bbq. Just as well we don't mind the music or we would need our ear plugs. This is not the night for the Sonos system to be operating in our back garden. Very efficiently got the Feb newsletter out today and seem to have been busy indoors. Thank you for all the lovely comments. 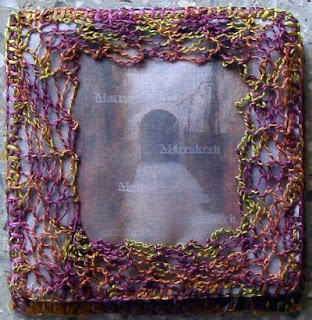 Fulvia - I am so flattered - I love Fulvia's work - have a peep at her website. I am working on some image and words for the next page - hopefully get it done tomorrow. Along with my HH stuff as I have got a bit behind and I am anxious to get some more work done. 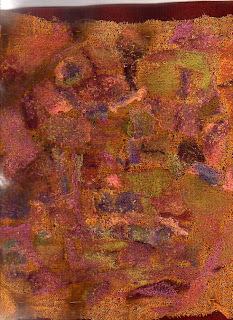 I have also been doing some rubbings with the Shivas for my article. 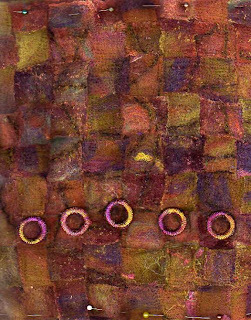 When they are dry and iron and stitched I will show you my tiny cushions. Aussie-Jo - you asked the thread colours. For the wool and threads I am using Federation - Jacinta chose this name (not sure why) and she dyes it in wool/silk/silk threads and I have a matching machine rayon. I thought the colours just suited the Marrakechian atmosphere for me. 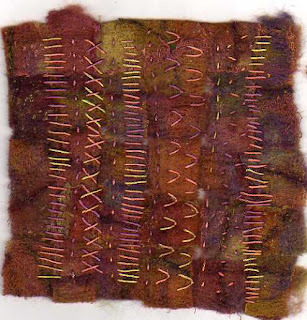 I have also been stitching with some of the threads from the Valdani Vintage Hues little boxed set. I just thought the tiny spools so cute that I had to use them.